More than two hundred species of Papilio have been identified in various habitats around the world, and each has adapted to the particular climate and environment. The Papilio xuthus in particular can be found in open woodlands and gardens in central and southern Asia (Miller et al. 2004). The caterpillar typically feeds on citrus fruits at night, and is concealed in leaves during the day. The butterfly can be spotted flying and lounging during the daytime (Marshall 2006). 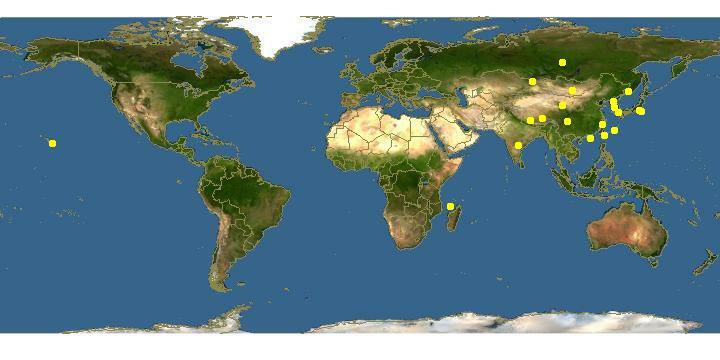 The following image shows the locations that P. xuthus can be found around the globe. Although popular in the Eastern world, P. xuthus is currently only established on the Hawaiian islands in the Americas. The exact date of origin is not known, but the organism was identified in Maui in March of 1975 (Sevastopulo 1976). It is believed that the organism either came with the Pacific winds or was brought over from the oriental region by accident (Sevastopulo 1976). Either way, the fact that it survived the journey is astounding. At first, experts were concerned that the introduction of a new species may cause problems, such as overpopulation. However, the wasp egg parasite, Trichogramma, and a tachinid fly, Exorista sorbillan, help to keep control of the P. xuthus population (Sevastopulo 1976). Most insects that are herbivores have specialized habitats that are specific to their source of food (Friberg and Wiklund 2008). In the case of P. xuthus, the organism feeds specifically on the Rutaceae family, which is composed of citrus fruits (Miller et al. 2004). These fruits only grow in certain regions of the world, which limits the places that P. xuthus can successfully live. It was previously believed that specialized feeding is linked to digestive and physiological advantages to an organism's fitness. However, recent research suggests that predators of insects may also influence host plant choice by increasing selective pressure (Friberg and Wiklund 2008). The eggs and larvae of the butterfly are more likely to survive on their host plants in a specific habitat versus a different host plant in either the same or an alternative habitat (Friberg and Wiklund 2008). You can read more about the interaction P. xuthus has with the Rutacaea family on the interactions page!